Finally finished the deck plans and section for the Sharptooth Class Merchant ship. I'd still like to put some polish on it, fix some line weight issues, jazz up the image overall, add more (and more creative) ship names. but this will have to do for now. 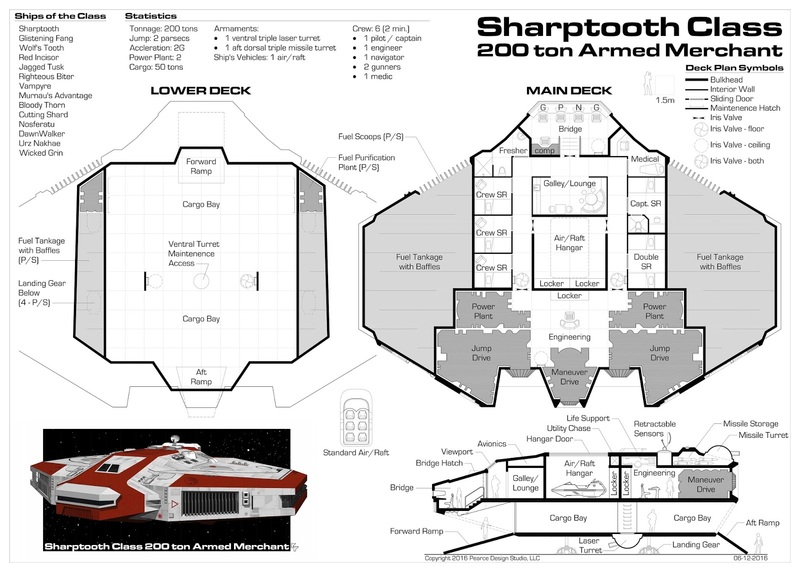 For a higher resolution PDF, click this link: (Traveller Starship Deck Plan Sharptooth Class). It was created to be printed out on 30"x42". Scale is 1" = 5'-0" so it can be used with 25mm miniatures. Enjoy! Good, clean design. Great work. Your link just leads to each user's Google Drive page. Is there a sharable link? A+ ship design I was wondering if I could the manufacture costs etc of the ships. If you don't mind my saying, those ramps look pretty steep. I've always had a problem with ramps in my own designs, because to have a ramp which actually seems usable, it takes up a *lot* of room. My own ships for Traveller have always drifted to the ground like a downy feather and sat directly on the ground (no landing gear as such) or else had cargo lifts.